Did You Know About These Payment Options for Adaptive Devices? Could your senior loved one benefit from more stability in the shower or tub? Does he or she require a walker or rollator to move around? Then it’s very likely that you’ll soon be looking to buy in-home adaptive devices. It’s also likely that you’re wondering how to pay for these assistive products, and if any of them may be included under Medicare or insurance. If a person has Medicare Part A and qualifies for the Home Health Benefit, then Medicare will pay for 80 percent of the allowable cost for medically required durable medical equipment. If a person is covered by Medicare Part B, he or she does not be required to qualify for the Home Health Benefit, and Medicare will cover 80 percent of the permissible amount for medically necessary durable medical equipment. e. be appropriate for use either in or out of your home. The veteran’s administration is especially helpful in supplying durable medical equipment to individuals who qualify. Veterans or the spouse of a veteran may be eligible for benefits. Learn more here. If the equipment or supplies required are medically essential, they may be partially covered by some private insurance carriers. Coverage is either based on the person’s coverage, or, if the individual seeking coverage is a dependent, then the family policy should be examined for specifics on dependent coverage. Bear in mind, though, that while having your insurance provider pay for some of the expense may seem like the best deal, it is possible to find the products you need at an “out of network” vendor with a reduced price. 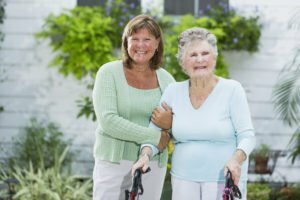 If your senior loved one needs home care equipment that is not covered by private insurance, consider looking into equipment rental solutions or formerly owned items such as wheelchairs, scooters and handicap vans. Used equipment ads may be found in disability publications as well as on websites such as www.Craigslist.org, www.ebay.com, and www.unitedaccess.com. If you would like further assistance either in selecting or purchasing home care equipment and other adaptive devices for a loved one, contact the California senior care experts at Hired Hands Homecare today. We can provide a free in-home assessment, make equipment recommendations, arrange for order and delivery, and answer any other home care related questions you may have. Contact us online or call us at (866) 940-4343.